Ever since Freud proposed that certain ideas can be permitted to become conscious only in their inverted and negative forms, interest has grown into the entire realm of the presence of absence, so to speak. Or, perhaps, it is better to term such mental contents as the presence in the form of absence. These two ways of conceptualizing Freud's negation have led to a panoply of ideas that include negative hallucination, psychic holes, negative narcissism, selfishly motivated erasure of the Other, and the so-called "work of the negative". 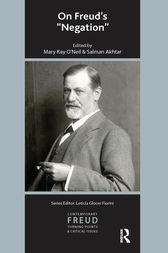 This volume elucidates these concepts and refines the distinction between Freud's negation and subsequently described mental mechanisms of denial, repudiation, isolation, and undoing. The book also provides contemporary perspectives on the developmental underpinnings of negation and the technical usefulness of the concept, including its implicit role in negative therapeutic reactions. A thought-provoking and conceptually illuminating volume.